The Vatican Business Conglomerate is now on the defensive in regards to the document leaks, concerning the Vatican Bank’s offshore Cayman Islands banking division. Quite recently, like clockwork online religious publications on the internet, National Catholic Reporter has a story titled Why the ‘Vatican Bank’ doesn’t exist , or in Catholic Culture has a story running Vatican ‘bank’ isn’t really a bank . The Vatican bank, formally known as the Institute for Works of Religion (IOR), is aiming to comply fully with international norms and has applied for the Vatican’s inclusion on the European Commission’s approved “white list” of states that meet EU standards for total financial transparency. But this offshore Cayman Islands banking division controversy could throw that chance into disarray. Talk in the Italian media about the Vatican Banks offshore account division is causing more to question if the Vatican could comply with any EU banking reforms whatsoever. What is at stake?In June 2012, a European commission will decide whether the Vatican has abided by tough international anti-money laundering and anti-terror finance laws by joining the so-called “white list” of countries that share financial information. The Vatican has always been a closed city that has been blamed for covering up priests who were suspected child molesters and even relocated them, appointing such individuals into positions of power where they again reoffended. To add to the intrigue, sources suggest a power struggle exists inside the Holy See.As of now, the main area of concern, however, is the Vatican Bank’s offshore Cayman Islands banking Division. The Vatican Bank, or the IOR, is outside the Italian central bank’s regulatory grasp. The Vatican is notoriously secret about this division, its clients, and amounts of its financial holdings. What we do is quite shocking and scandalous.The IOR is built on secrecy. It keeps secret accounts, does no audits and claims to destroy records after ten years. It offers secret accounts to many who “have had problems with the law,” said one of its past presidents. There are no cheque books. Everything is done by transfer, by cash or in gold bullion, so as to be untraceable. This is perfect for money-laundering. 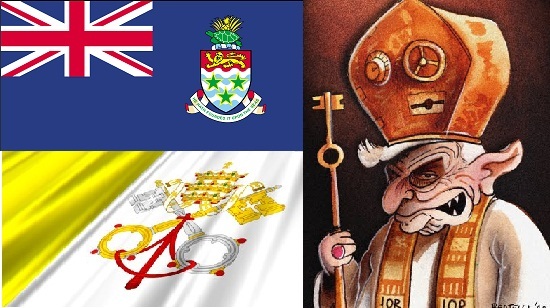 The Vatican Bank has quietly established itself in the offshore financial centre of the Cayman Islands. The Vatican Bank escapes scrutiny from Italy. Recent media spotlight suggest its clients consist of international financiers, Saudi oil barons, Russian Billionaires, German arms dealers, members of royalty and members of the underworld. Some of the leaked documents have carried the processing stamp of the Vatican secretariat of state, implying an internal leak.Only this year, the Vatican has taken remarkable steps in the past year to be more transparent in its financial dealings and co-operative with international requests for financial data. Nino Lo Bello, a long time business correspondent for the New York Times, wrote a book on the Vatican called the Vatican Empire.In his research, he found out the Vatican owned an airline, a banking system, condom manufacturers, owned all the nuclear weapons manufacturers, including biological weapon’s manufacturers, all such information is easily accessible in the business directories. Such business operations are contrary to Catholic doctrine. The Italian media continue to search out the taste of corruption.In fact, the leading newspaper Corriere della Sera is up in arms over such allegations. This story will continue to unfold.